Beth El-Keser Israel (BEKI) in New Haven, CT presents a solo exhibition of US/Israel based artist Max Missner Budovitch from December 2, 2013 through February 28, 2014. 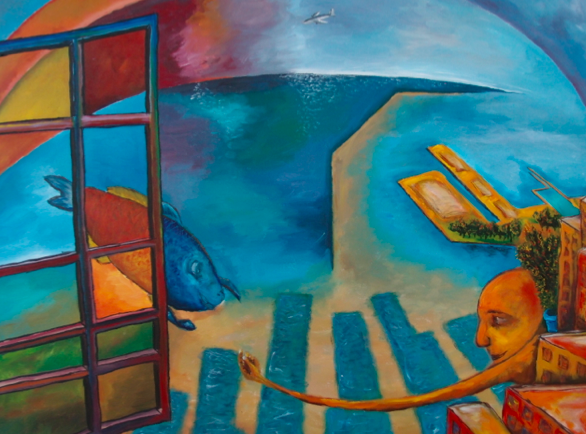 The artist will give a talk on Saturday January 25, 2014 at 12:30pm. 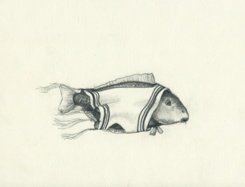 In his most recent body of work, Budovitch introduces the carp as an embodiment of the universal, human imagination. 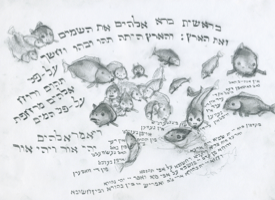 Intrigued by the 2003 story of a New York fishmonger who reported that one of his carp had spoken to him in Hebrew “emphatically advising the storeowner to be a good person,” Budovitch elaborates on this anecdote in unique and richly rendered sketches involving Jewish history, Talmudic study and some of the most pressing problems of all time – violence and justice, nature and science, and translation. This work also reveals to the viewer how turns of phrase, irony and laughter bring out our deepest response to the dilemmas of life. Budovitch was born and raised in Chicago and grew up along the shores of Lake Michigan, combing the sand, fishing, swimming and exploring the urban landscape of Chicago’s downtown and ethnic neighborhoods. Everyday experiences gave him an instinctual sense for nature, the urban environment and the mysterious border at which they meet. Budovitch holds a BA in Philosophy from Yale. For the most part, he has studied art independently and has been greatly influenced by mentors and writers. His work has been exhibited in several Chicago galleries, publicly displayed in Israel, and privately commissioned. He has pursued his love of water as a recreational fisherman, surfer, and professional oysterman. He divides his time between Chicago, New Haven, and Tel Aviv. 85 Harrison Street, New Haven CT.